The entire WMS420 wireless system consists of the SR420 stationary receiver, and HT420 handheld microphone. The HT420 handheld transmitter is available with the patented D5 dynamic microphone acoustic. 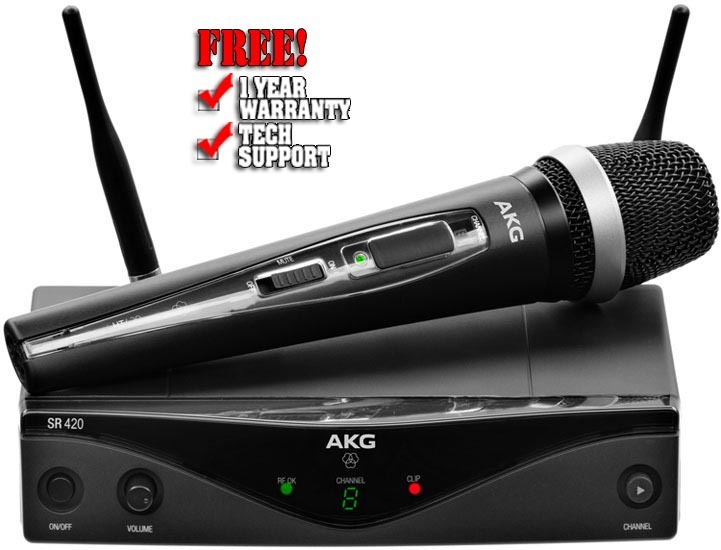 This capsule guarantees maximum rejection against feedback, reduced handling noise and the famous AKG sound. Both transmitters are shipped with charging contacts that enable the use of rechargeable batteries. Moreover the transmitters offer exceptional eight hours of operation time from a single AA size battery, which dramatically reduces the operating costs in day-to-day use. The detachable receiver antennas allow the use of professional accessories, such as antenna splitters and remote mounted directional antennas for multi channel systems. The WMS420 series includes three different bodypack sets. The SR420 provides an audio clipping and RF signal LED for easy monitoring of systems status. Best audio signal output is provided via both a professional XLR and a 1/4" jack connector. For worldwide use, the receiver comes with a universal, switched mode power supply kit. The SR420 comes with two external and detachable antennas on the rear side and BNC connectors at standard 50ohms.